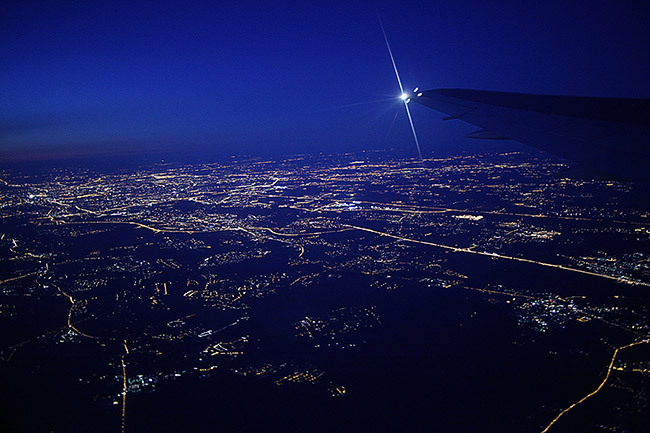 It’s a slightly esoteric joy, but flying at night can be strangely satisfying. Tonight, I fly in my own sensory deprivation chamber, a semi-anechoic capsule seemingly isolated from reality. The sun rolled down beneath the Earth hours ago, leaving me in a blackness well beyond merely dark. It seems there’s no outside light above or below, forward or aft, left or right. I’m suspended in an obsidian void of nothing. My little cocoon of darkness flies into the wind at 150 knots with no visible means of support. A high overcast blocks stars, and mostly uninhabited Northwest Texas swallows what few lights might otherwise join together to suggest there’s an Earth below. The regular subdued flicker of my strobes startles the night as if to confirm that I’m once and truly alone. My tiny universe seems to end at my airplane’s spinner and wingtips. Like the enigma of a tree falling in the forest without sound, if you fly through a pitch-black sky and there seems no Earth below, is it really still there? On the panel in front of me, my artificial world consists of 22 instruments and six radios backlit in pale red, reassuring me that I’m not really alone. They allege I’m somewhere near Wichita Falls and Amarillo, friends from long ago, wisely sleeping in the cold night of late autumn. The altimeter suggests I’m 12,500 feet above sea level, a meaningless number since the nearest sea is 500 nm away in Golfo de California, Mexico. More relevant, the chart indicates I’m 8,500 feet above this section of West Texas. Outside my insignificant airplane, the sky acknowledges the coming of winter, -21 degrees C, but with the cold overcast comes a velveteen-smooth passage that’s long forgotten summer’s uncomfortable turbulence. My headset further isolates me from reality, allowing only a distant background hum to invade my senses. The heading bug covers 286 degrees on the HSI, and the GPS falls back on those famous explorers, Latitude and Longitude, to advise that I’m only 286 nm from tonight’s destination of Santa Fe, New Mexico. Other instruments collectively counsel me not to make any mistakes in the dark. My airplane’s totalizer (which always sounded like some kind of Star Wars laser weapon or something from another of those movies by Schwarzenegger) warns that I have only 38 gallons remaining before I’ll need to return to Earth, black or not, seen or unseen. Fortunately, even flying into a characteristic headwind—assuming I’m actually moving—I’ll need only two hours fuel at 11 gph. Looking out at the West Texas plains, or at least, where they should be, I wonder if I’m anywhere near absolute dark. Just for fun, I turn the panel light rheostat all the way to the left, right next to off. Not dark enough. I turn the instrument lights off. Still too much residual light. Not absolute darkness. Not Carlsbad Caverns during a power failure. How much darker if I just kill the master? I do, inconveniently forgetting that the autopilot will quit without power. Of course, it does, and I quickly apologize to God and flip the master back on. At the same time, as if determined to frustrate my search for full opaque, I suddenly fly out from beneath the overcast to a recognizable world resplendent with stars. No moon tonight to ruin the mood. Almost simultaneously, lights begin to appear below, eager to compete. The terrain also rises, spoiling my search for visual absolute zero. The sky is polished smooth by the wind, and I drift along as if on rails. Somewhere down below, in fact, everywhere down below, the plains of Texas give way to the hard hills and mountains of eastern New Mexico. Off to the south, I see the gentle glow of Albuquerque highlighting the Sandia and Manzano Mountains. To the north, the Sangre de Cristos, southern terminus of the Rockies, angle down out of high Colorado with snowcapped peaks pointing the way to Aspen, Leadville and Telluride. At 60 miles, Santa Fe announces itself as a half-halo of dim light behind higher terrain. In apparent protest of my search for ultimate dark, lights begin to appear everywhere as I approach the city. Straight ahead, far in the distance, I see a cluster of disembodied lights that seems to float above me, perhaps a flight of aliens escaped from Roswell? No, it’s just the suspended illumination of Los Alamos, where the first nuclear weapon was developed, looking down on high New Mexico from its station 8,500 feet up. The lack of light between Santa Fe and Los Alamos gives the Atomic City the illusion of being suspended in space. At 40 miles, I see the lights of Santa Fe itself, hunkered against the side of a mountain, shivering from the cold wind of a late November storm now past, but not before coating the high plains with the first snow of the season. Santa Fe, for me a town of things remembered, is the quintessential Old West, home of the Santa Fe Trail of Gold Rush days. Santa Fe is steeped in 19th-century tradition. The city embraces its heritage, a cross between American and Mexican folklore. Silver-mounted turquois is the jewelry of choice, and the Santa Fe Plaza is home to numerous Southwest festivals. Until a few years ago, Santa Fe had an ordinance that clung to tradition by insisting that all new buildings had to be of adobe construction to maintain the city’s image as the “real” Southwest. Even in November, it’s a world of tourists below. The star-shaped airport for the capital city perches on a mesa south of town, 6,300 feet above sea level. In summer, it can be a fierce opponent for those uninitiated in the hazards of high density altitude. Santa Fe can be especially hazardous because terrain climbs higher in three of four directions. Too many years ago for most pilots my age to remember, I was number two for takeoff behind a tired-looking, tuna-tanked Air National Guard Cessna 310 on Santa Fe’s runway 02. My wife and I were on our way home to California after a visit with her parents. It was July hot, and the 310 ahead of us departed, climbed several hundred feet, then apparently lost an engine and began to sink toward the horizon. I watched it slowly descend, then, gradually drop below the opposite end of the runway as the pilot fought a losing battle to keep it in the air. It finally disappeared into a cloud of dust off the end of 02. I learned later the pilot had flown the airplane into a sand berm off the end of the runway, but the impact was gentle, there was no fire, and all three occupants walked away. I was next in line for takeoff, and I hurried the controller to release me. I was afraid my in-laws could call the tower and tell the controller to have their idiot son-in-law in the Bellanca bring their daughter back to the ramp so they could send her home to Los Angeles in a sensible Greyhound. Fortunately, I got away clean. Tonight, density altitude is well below field elevation as I flip on the landing lights at 10 miles, call the tower and set up for a wide right base to runway 33. I touch down with a reassuring squeak, taxi to the ramp, check for angry in-laws and rejoice in the fact that, once again, science and technology have triumphed over fear and superstition. This is Senior Editor Bill Cox’s 400th Cross-Country Log, making his the longest-running column in any aviation magazine at 33 years. You can email Bill at [email protected].